From left to right: two Masada destroyers (Alesia and Plataea), an Orion multi-role cruiser (Perseus), a Northhampton frigate (Sergei Krikalev), and a Conquest battleship (Audacity). The ships on the far side of Audacity mirror the classes of the near side: John Young, Pegasus, Thermopylae and Zama. 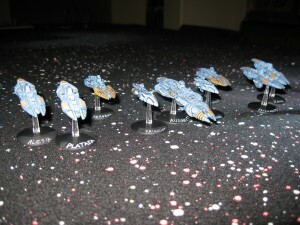 Ravenstar Studios currently owns the line, and recast them in resin, with pre-made base points. I’ve got some of the new Northhamptons in the queue to be painted. 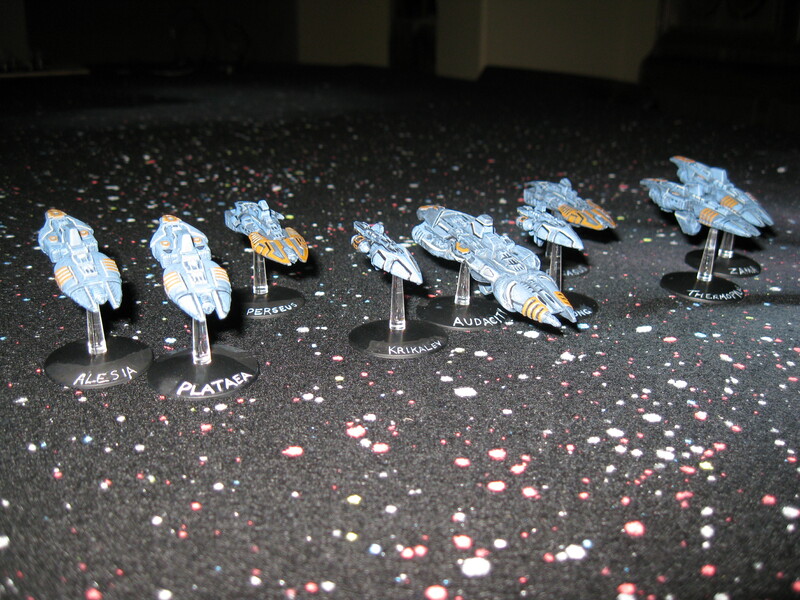 This was the highest-pointed fleet in the first playtest, as the sculptor managed to jam all the high-value weapons as he could on these sculpts. For the pick-up playtest, they went with vanilla crew attributes (Discipline d8, Initiative d8, Gunnery d8).